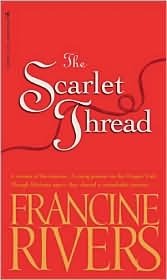 The Scarlet Thread by Francine Rivers was a book I picked simply because of the author, Rivers never disappoints. This book is not my favorite of hers, but it has a very good story and is well written as it's about two different women's stories weaved together. The main story is about Sierra Madrid who's life changes suddenly with a move and a cheating husband while her own emotions and loss overwhelm her. This story is hard to read because it is so real and it is how life is for many people. She finds a diary by a young woman who traveled the Oregon Trail and had many trials herself with her own family. It's neat to read how the past and present can be so similar. This book is great about forgiveness. I recommend this book but if you haven't read Francine Rivers I wouldn't read this one first. Here is an excerpt to The Scarlet Thread-excerpt.